Haddon Robinson passed away this morning. He was the Harold John Ockenga Distinguished Professor of Preaching at Gordon-Conwell Theological Seminary and author of one of the most influential books on preaching, Biblical Preaching. His article on “The Heresy of Application” is one which still marks my preaching today. I salute you, Dr. Robinson! I’m grateful for God’s work in you for making those who preach his word better in the calling they have. I know that’s been true for me. 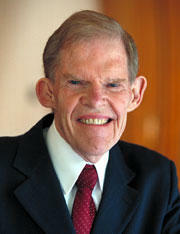 Haddon Robinson was the president of CBTS when I began there right out of Bible College in 1979. It was a difficult task to follow Vernon Grounds, but Dr. R was his own man. I haven’t been in the preaching ministry, I’m a counselor, but I still remember one line from a sermon he preached in chapel. The gospel story about the good Samaritan. The point he made to the question,”And who is my neighbor?” He kept coming back to the point of his sermon – “Your neighbor is anyone whose need you see; whose need you’re in a position to meet.” He gave me some excellent counsel once through a letter. I’ll never forget him. Although he was not a counselor I’d choose him over any counselor I know today. He’s always been such a man or character and is so Biblically oriented. I will miss him. I used to love to listen to his radio Bible study with Alice Matthews and Mart DeHaan. Such a wise man.